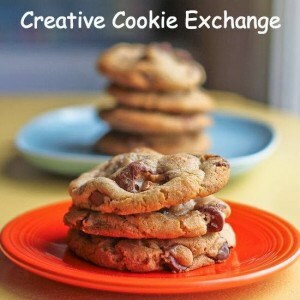 Creative Cookie Exchange is today and I am also doing a cookbook review. 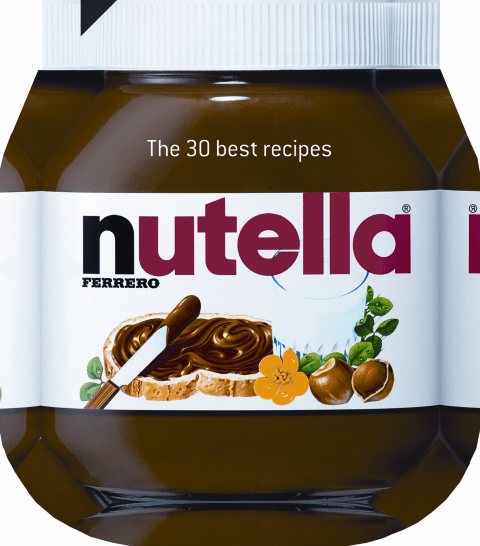 A cute little cookbook with 30 best recipes from Nutella. 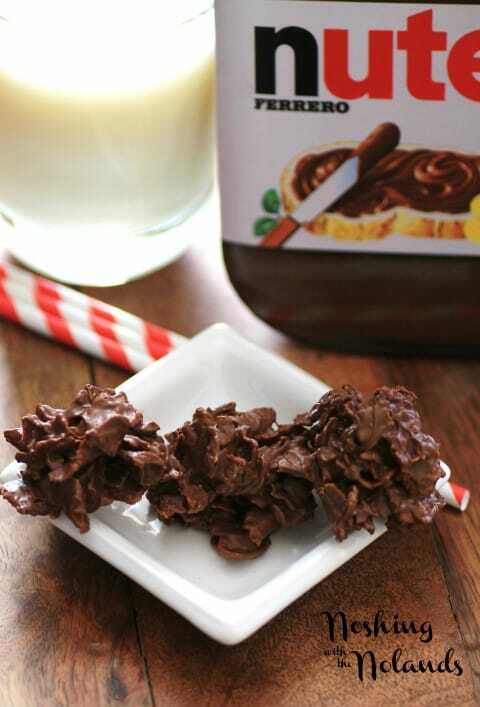 Our theme was no bake cookies for this month on Creative Cookie Exchange so these Nutella Clusters fit in beautifully!!! 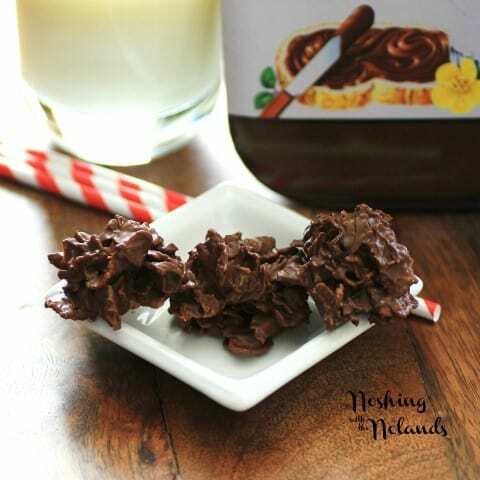 I needed to make something for our church refreshments and didn’t want the oven on with our summer heat right now, so these no bake Nutella Clusters were perfect and really enjoyed by the parishioners of the church too. They are crunchy with a deep rich chocolate flavor from the Nutella!! They are super easy to make too!! Three ingredients and that is it!! The cookbook utilizes the wonderful versatility of Nutella, showcasing it in recipes like Mini Coconut and Nutella Palmiers, Pear and Nutella Crumble, Nutella Whoopie Pies, Banana and Nutella Tartlets, to name a few. So many wonderful recipes and taking you from just slathering it on toast to divine desserts. The cookbook is so cute as it looks like a jar of Nutella!! Each recipe in the book has a beautiful picture to accompany it, it is a very adorable book. The author of this book is Ferrero USA, which first opened business in 1969 and chose it’s lead product in the vast US market not to be Nutella but Tic Tac!! The company not only has Tic Tac but also Rocher and it hoping that Nutella with it’s distinctive taste will become a big success here like it is in Europe. Melt the chocolate and Nutella in a saucepan over gentle heat. When they are melted, add the cornflakes. Mix together carefully. Put small mounds of the mixture on a sheet of baking parchment or in a small paper cases. Chill for at least 2 hours before serving. And lucky me having all these ingredients in my pantry. I’m seriously thinking of whipping up a batch before the end of the week. Thanks Renee, they are so easy and so good!! My daughters eat Nutella with a spoon but I am sure they would LOVE these crunchy treats as well, Tara. And they are so easy! Yayyy Nutella!!! These clusters are so simple and so tasty! Thank you so much Kayle!! so simple and delicious looking. Summer is the perfect time for no bakes! Summer sure is the time for no bakers, thanks Renee!! These sound similar to a treat my English friend makes called Crackle Cakes– I’ll have to ask her if she uses nutella or something else. With three ingredients these look quick to make and I bet they disappear quickly too! Wow these great and the are super easy. Yes super easy and don’t you just love Nutella Jill!! 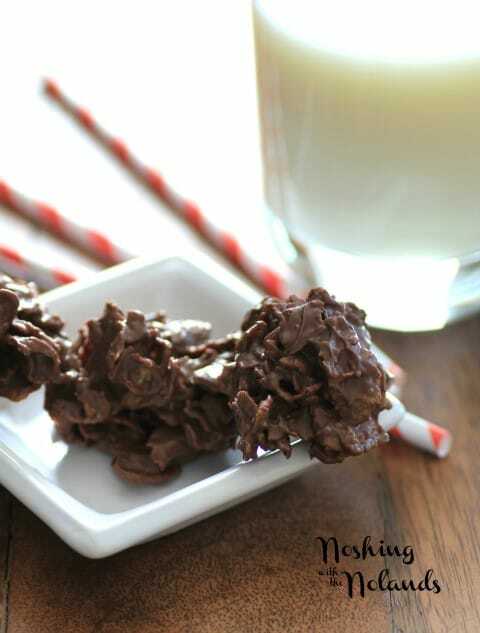 Oh, how I love no-bake cookies! And with Nutella???? Scrumptious!! How cool is that! A cookbook devoted to Nutella. This spells trouble with a capital T.
Oh goodness Tara, these cookies look positively addicting! I think I will make them with my grandkids when they come to visit! Only 3 ingredients and I love me some nutella! I need that cookbook. lol Great no bake recipe! Mmm, we love Nutella! (Though, really, who doesn’t?) I built a wood fired pizza oven in my backyard, and whenever we make pizza, we HAVE to make our dessert pizza with nutella, dollops of mascarpone, and a generous sprinkling of brown sugar. It’s so good that, when I’ve planned different desserts for a pizza night, our guests have rebelled and gone to the grocery store to get the ingredients during the party. That sounds amazing Nikki!! Thanks for sharing!! Thank you so much for trying the recipe and for coming over to tell. So glad you and your family enjoyed them so much! !